Prime Minister Narendra Modi has announced the launch of the new web portal services with an aim to help promote the idea of organic farming amongst the farmers. With the launch of the new web portal services the government aims at encouraging farmers to carry out farming methods using organic fertilizers. The new drive has been launched to help promote Rasayan Mukt Bharat Abhiyan. 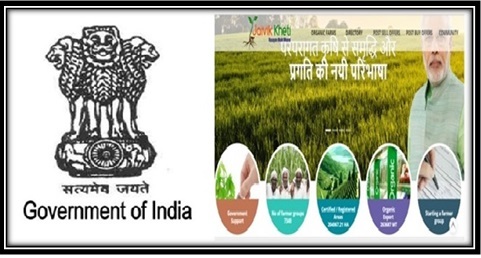 The farmers of the country can collect more set of information updated on the web portal by the central government related to various government schemes including MIDH and Micro Irrigation, Paramparagat Krishi Vikas Yojana and RKVY (Rashtriya Krishi Vikas Yojana). The online web portal is Live for both traders and farmers alike to get registered. Both traders and farmers can collect information related to benefits of organic farming and at the same time maintain the best condition of the soil. The farmers can also get more information related to making use of animal waste and farm waste and maintaining good crop cultivation. It will offer with in depth information about various biological materials that can be used by farmers to help improve the condition of the soil nutrients. The web portal will also offer farmers with information related to combination of traditional and innovative farming methods. Using the online web portal services farmers can get connected to the traders directly for selling their farm produce at the best rates offered by the traders. To complete the process of registration on the web portal farmers have to log on to the official web portal using the link provided above. Once logged in then on the main page of the website they have to select the “register” option. You can also get registered directly by clicking the link http://www.jaivikkheti.in/Buyer/Buyer/RegisteredAs.aspx. When on the web page you are free to get registered as a trader or as a farmer. You can also make the selection of getting registered as other user type. For farmers they have to get registered under farmers category and then proceed further by selecting “Jaivik Kheti web portal” registration option. You will be redirected towards the application form on the web page. You will have to provide with all details related to personal information along with state and district information. Traders can also get registered who are interested in selling their agricultural equipments and products. You will be redirected towards the registration form in which you have to provide with detailed information. Once you have provided with all desired information on the registration form you just have to make the submission of the form by clicking “Submit” option. The method of organic farming encourages farmers to make use of natural synthetic products including feed additives, hormones, pesticides and fertilizers. It focuses on making use of rotation farming techniques, plant protection methods, maintaining the grade of nutrients in the soil, crop residues, nutrient mobilization and animal manures. In case any farmer is interested in transforming from chemical farming towards organic farming they need to follow below mentioned steps. They have to try and avoid making use of the harmful chemical based weedicides, fertilizers and pesticides that can harm the soil fertility and the crop quality. More or organic products should be used for farming. It is also advisable for farmers to avoid making use of the GMO products and seeds that have been treated by harmful chemicals. Along with this the farmers also have to ensure to make use of techniques involving inter cropping, rotational cropping or multiple cropping on their farm lands. The farmers should also be encouraged to make use of Trap crops or combination of forestry system, agricultural system and Horticulture system. Farmers are also encouraged to prepare the dung manure on their farms itself using cow dung. To effectively use this system the farmers will have to perform seed treatment (waste treatment and Beejamrutha). To help increase the fertility of the soil the farmers can try and use biopesticide, jeevamrutham, biological inputs and panchgayva. To ensure that the plants grow naturally farmers can make use of waste decomposer, Matkha khad and Amritpani. To ensure protection of the plants farmers can make use of Extract, Dashparni and Neemastra. It is also important for farmers to try and recycle household waste, green manure, mulching and compost as they are natural resources of nutrients. It is also important for farmers to adopt the ideal of animal husbandry without using antibiotics. This includes breeding desi cattle, birds, goats, poultry products and fisheries. When farming it is important for farmers to make use of only untreated seeds. It is also important for farmers to plant more nitrogen rich plants to keep the predators away naturally. This will also help in maintaining the soil fertility as it is a good source of compost. They also act as buffer zones and wind barriers. This has been encouraged by the government under “Har Med Per Peadh”. It is also important for farmers and government to eliminate the practice of crop burning and crop wastage and to get started with In-situ composting. It is also important for farmers to get registered under PGS-India for certification from the government. The facility has been provided by the government free of cost. With the implementation of the new web portal it is obvious that the government aims at encouraging all farmers to get eco friendly and implement the ideal of organic farming in their farm lands for crop cultivation. The Modi government promised a better future for Indian farmers in the election manifesto. Since he took up the duties of the PM, he has continuously launched developmental schemes for agricultural labors. He also puts stress on the importance of organic farming or ‘jaivik kheti.’ This form of agriculture does not involve use of chemicals. So, farmers will be able to increase the quality and quantity of their produce. This form of agriculture will eliminate any chemical residue in the crops. It will also lower the farming expenditures. Jaivik kheti will also play a vital part in maintaining ecological balance. Studies suggest less use of chemicals in farms will also cut down the rate of global warming. Reduced use of harmful chemicals will also preserve the health of agricultural workers. I can’t register my name on farmer portertal.Can you help me?